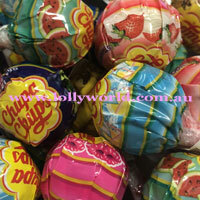 Chupa Chups must be close to the original lollipop having been around for 60 years. Purchase in a 10 pack, 100pcs Tub and 1,000pcs Mega Tin. In all sizes the Chupa Chup flavours will be a mixed assortment. Each Chupa Chup is approx 12 grams. The 1000pc mega tin is great value for businesses that want to give away a quality lollipop of at any corporate function where a little sweetness is needed.